Saturday May 16, 2015 was North Highland Woldwide Consulting's 4th annual Day of Giving Back where 22 offices across the US and UK volunteered in their communities. We had over 1,500 volunteers come out, giving back to those less fortunate. Our Central Florida offices (Tampa, Orlando, Jacksonville) had a wonderful time making an impact in our communities. The 2015 Day of Giving Back was the second year the North Highland Tampa Office volunteered at Metropolitan Ministries. The organization’s mission is to “…care for the homeless and those at risk of becoming homeless in our community through services that alleviate suffering, promote dignity and instill self-sufficiency.” Services include food, lodging, childcare, and life skills. We put on gloves, hair nets, and aprons in order to help serve hot meals to residents. Majority of the food is donated to Metropolitan Ministries by local restaurants and church groups. Saturday's lunch was Chicken Parmesan! We also helped “behind the scenes” by grilling hundreds of chicken breasts for the following night’s BBQ dinner. 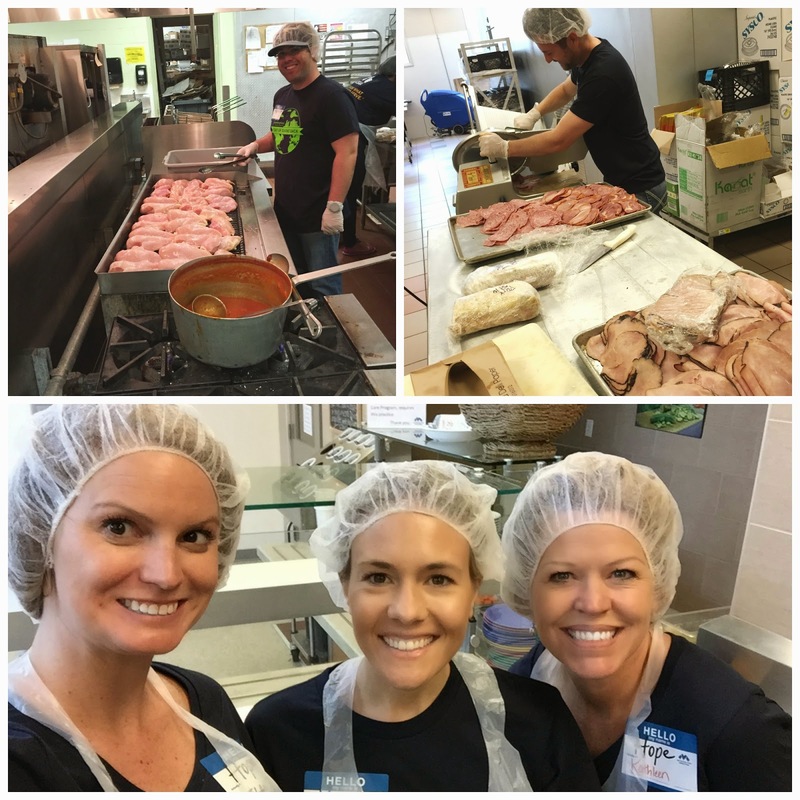 We sliced hundreds of pounds of lunch meat and assembled sandwiches to be sold at Metropolitan Ministries Inside the Box Cafe, where every meal sold gives a meal to someone in need. On Saturday morning, the North Highland Jacksonville office hosted a Professional Development Day at the Five STAR Veterans Center. Nearly 20 veterans participated in this four part event; sessions including Dress to Impress, Job Seeking Tips & Tricks, Online Presence and Resume 1on1. Throughout the morning, the Veterans broke out into small groups and rotated through the four 30 minute sessions, facilitated by North Highland. Following the sessions, everyone reconvened to wrap things up and enjoy some BBQ with the Vets! Our day volunteering at Five STAR Veterans Center brought invaluable support and guidance to Jacksonville's local veterans. Please check out www.dayofgivingback.com for more information. The North Highland Orlando office spent their Saturday morning at Clean The World, an organization with a two part mission; 1) recycle hygiene products from resorts and hotels to eliminate waste 2) by distribution of hygiene kits to impoverished people throughout the world, prevent millions of hygiene-related deaths each year. Alongside other groups of volunteers we sorted through 90,000 bottles of shampoo, conditioner, body wash and lotion and 27,000 bars of soap. The Orlando office is excited to have impacted not only the local Orlando community we live in but also global communities throughout the world with the hygiene kits that will be created with these items. The 2015 Day of Giving Back was a great opportunity to further a great organization’s mission and come together as an office to make the world a better place. North Highland Central Florida also took part in a global food drive, hosted by each local North Highland office. We are still tallying up the total pounds contributed throughout our 22 offices and will update this post with the numbers, which I know will be in the thousands.